O&K Print Watch keeps track of supplies in printers or multifunction devices. The application keeps track of supplies for each printer or multifunction device. This way, it can generate a comprehensive report for all printers, specifying spare parts to be replaced or consumables to be replenished. You can access the report on supplies whose current level is below the threshold via the following column in the left tree of the Control Program: Supply < 40%*. * You can set the threshold level for supplies via this menu item: Tools -> Supplies. The report will show each printer whose current level of any supplies is below the specified threshold. 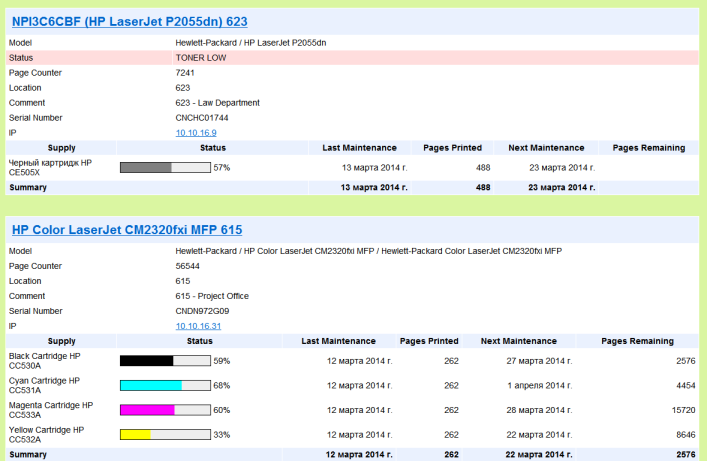 In addition to the current level of supplies, the report will show the date of last maintenance (replacement of spare parts or replenishment of consumables), the number of pages printed since the last maintenance, the projected date of the next maintenance, and the approximate number of pages that can be printed before the next maintenance. The date of the next maintenance and the number of pages that can be printed are calculated based on the printing and maintenance history. O&K Print Watch’s assessment will become more accurate after you have done maintenance once or twice. 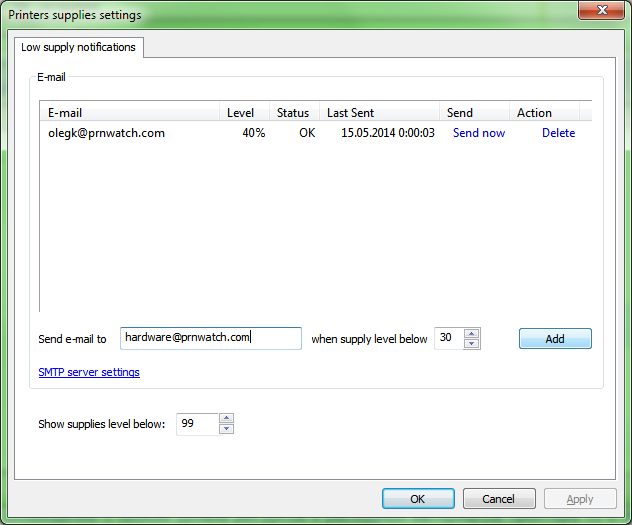 Configuring e-mail notifications on low level of spare parts or consumables. You can configure notifications via this menu item: Tools -> Supplies. Enter the recipient’s e-mail address and the threshold level of supplies. If the current level of supplies goes below the threshold, a notification will be sent. Notifications are sent once a day.